Climb on board the Magic School Bus and join the enthusiastic and indefatigable Mrs. Frizzle and her class on a trip back to the age of the dinosaurs! The game features three prehistoric time periods the Triassic, Jurassic and Cretaceous and seven areas Argentina, Arizona, Colorado, Tanzania, the Tethys Sea, Alberta, and Mongolia--to explore. Throughout the background, each time zone has various dinosaurs and other prehistoric creatures to learn about. Meanwhile back on the bus, there is so much to see and try. A map of the world shows you many sites where several fossils have been found. 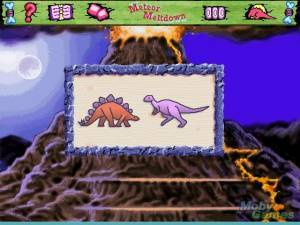 A nest with two joking dinosaurs which provides educational content as well as jokes, and a report zone, which has illustrations, pictures, and even clips from the PBS television series "The Dinosaurs". The reports tell about dinosaur behavior, myths, body parts, and how fossils are found. An X-ray lets you look at the skulls of different dinosaurs, and, best of all, there are lots of games and puzzles to solve. When you solve something in the game, you might get awarded "paleo" cards. These "paleo" cards are placed in a gallery, and they provide facts about what time period these dinosaurs lived in, their size and weight.